Adding to the growing list of Smart Phone compatible digital cameras with built-in Wi-Fi, Fujifilm recently announced the FinePix F800EXR pocket superzoom. The F800EXR is a pocket-sized compact camera with a 16-megapixel CMOS sensor, a 20x 25-500mm optical zoom lens, full HD video, RAW shooting and manual exposure modes – basically the F800EXR trades the built-in GPS unit from the F770EXR for built-in Wi-Fi connectivity. Like other Wi-Fi cameras introduced in 2012, the Fujifilm F800EXR uses a free, downloadable app that allows photographers to wirelessly transfer photos from the camera to their Smart Phone or tablet. This means you can have all the benefits of a “real” camera – zoom lens, manual exposure controls, superior image quality, etc. – but still be able to share photos on your favorite social network as soon as you take them, just as you would if you took them with your camera phone. 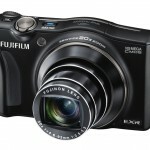 My own personal point-and-shoot is a pocket superzoom similar to the Fujifilm F800EXR. Only I use an Eye-Fi memory card because my camera doesn’t have built-in Wi-Fi. The built-in Wi-Fi is really smart and will definitely make sharing photos easier. If you’re like me and can’t stand the limited features and fixed lens on your camera phone, the Fujifilm F800EXR could be the answer. The 25-500mm zoom range is ridiculous compared to most other compact cameras, let alone camera phones. Intelligent Digital Zoom feature doubles the optical zoom range to an incredible 1000mm and there’s also a Super Macro Mode that allows you to focus as close as 5cm. The F800EXR also differentiates itself from most other pocket superzooms in that it includes RAW shooting, manual shooting modes and the 1/2-inch sensor is larger than most other point-and-shoot cameras. That larger sensor should mean better image quality – especially in low light. 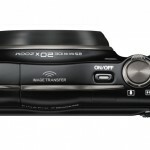 Other notable F800EXR features are 8 FPS high-speed burst at full resolution, Motion Panorama Mode, in-camera photographic filters (Pop Color, Toy Camera, Miniature, etc. ), and Fujifilm’s EXR Auto mode with Motion Detection, which automatically determines the best camera settings, including whatever is necessary to help freeze a moving subject. For more advanced photographers, the Fujifilm FinePix F800EXR has PASM modes as well as Fujifilm’s EXR modes; EXR HR (High Resolution) priority mode, EXR DR (Dynamic Range) priority mode, EXR SN (Signal to Noise) priority mode; which take advantage of the unique EXR sensor to deliver the best possible image quality in different conditions. Pocket superzooms are my favorite compact cameras because they’re so versatile and easy to carry. With its huge zoom range, RAW shooting, manual exposure controls, high-speed burst and built-in Wi-Fi, the Fujifilm FinePix F800EXR just moved to the top of my pocket superzoom list. I’m definitely going to have to get one of these for review. If you like the features of the F800EXR but you already own an Eye-Fi card or you’d rather have built-in GPS, take a look at the Fujifilm F770EXR. However, Fujifilm announced a second app with the F800EXR, the FUJIFILM Camera Application, which allows you to tag your photos with GPS data when you use the built-in Wi-Fi to connect to your Smart Phone. So, with the F800EXR you really get it all. 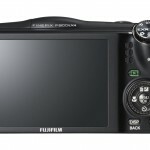 The Fujifilm FinePix F800EXR should be available at the end of this month (August, 2012). It’s compatible with both Android and iOS (iPhone and iPad) mobile devices. The suggested retail price is $349.95. An SLR recently lost. Wanted to buy new lenses for the camera. Despite the fact this isn’t a lens changeable, it does have major advantages. The lens specs isn’t bad and the fact that it has an optical stabilizer is definitely a plus. Each lens you buy with stabilizer you need to pay more for each so having a stabilizer in the camera means cost savings down the line. Had a Nikon D90 and looked in the mirror-less category. Had a lot of problems with the D90 display being very slow with the AF. Every time the lens adjust the focus, the display is updated and a lot of times had to turn off the AF to take a photo. The shutter just won’t click when the camera think it is still focusing. Normally not into shooting with extreme short (fish-eye) or long lenses anyway so the size of the zoom in the Fuji is sufficient.